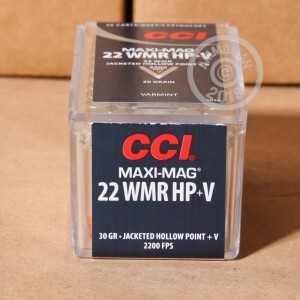 Put pesky critters down quickly and efficiently with this high-velocity .22 WMR ammunition from CCI's Maxi-Mag series. 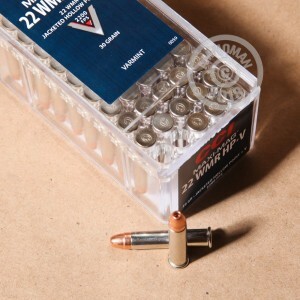 These cartridges fire an extra-light 30 grain jacketed hollowpoint bullet at 2,200 feet per second, a velocity sure to cause massive fragmentation upon contact with a varmint. 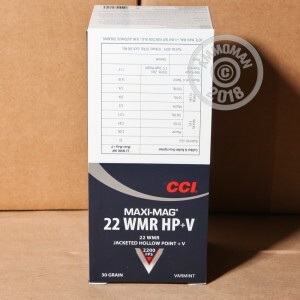 CCI ammunition is loaded in Lewiston, Idaho and enjoys a reputation as some of the best rimfire ammo in the industry. This ammo comes in 50-round plastic boxes and uses rimfire-primed brass cases.